Summer camp season is well underway, but it’s not too late for parents and camp staff to ensure children are protected from Lyme and other tick-borne diseases. GLA’s “Be Tick Aware” prevention kits. 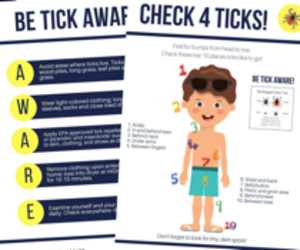 Each kit contains a poster with awareness tips, a tick removal tool, a “Check 4 Ticks” body check poster and a tick identification card. Global Lyme Alliance is the leading nonprofit dedicated to conquering Lyme and other tick-borne diseases through research, education and awareness. The 501(c)(3) organization is headquartered in Greenwich, CT. For more information, go to GLA.org.